"Augustus Reebkomp". Appendix A in [Pembroke Papers, vol.1]. MALTASS paper and microfiche in [SOG] Document Collection. Grant of arms to Augustus Montgomery, registered at the College of Arms on June 16, 1791. Reference No - Grants 17/376. Lord Pembroke was the petitioner. The arms are those of the Herberts with a wavy border to denote illegitimacy. Reebkomp's will 1796 mentions a grant of a coat of arms from the Herald's Office "by which my father the Earl of Pembroke acknowledges me as his son". Accounts of payments for Augustus Reebkomp. 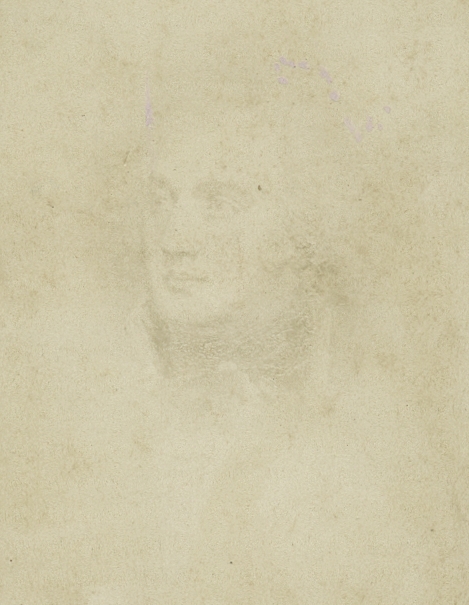 1779-1791. Herbert papers at Wiltshire and Swindon History Centre. 2057/A6/14. 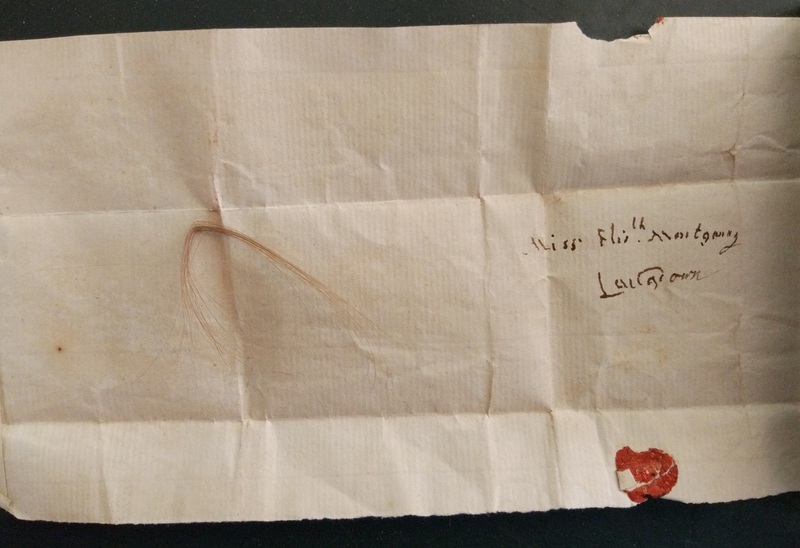 Will of Augustus Montgomery. [NA.UK]. PROB 11/1287/78. Capt. 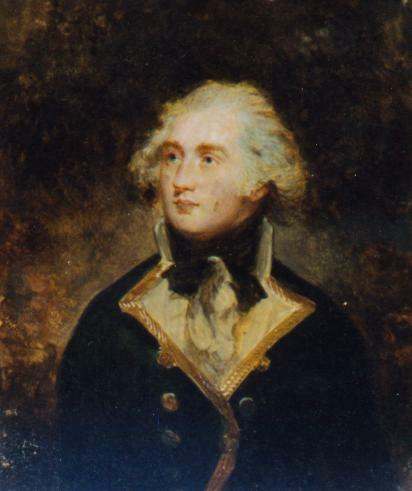 Augustus Montgomery, Royal Navy, 1789 (age 27). This is is a (very good) painted copy of the Beechey portrait at Wilton House. Light adjusted digitally. See full size. Picture in possession of Gibbon of South Africa. 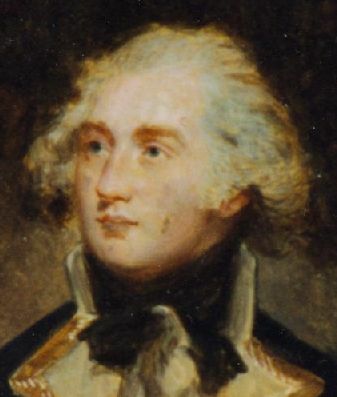 Reebkomp was the illegitimate son of the 10th Earl of Pembroke. It is about as well-documented an illegitimacy as you could imagine, and about as well-accepted by the legitimate family. 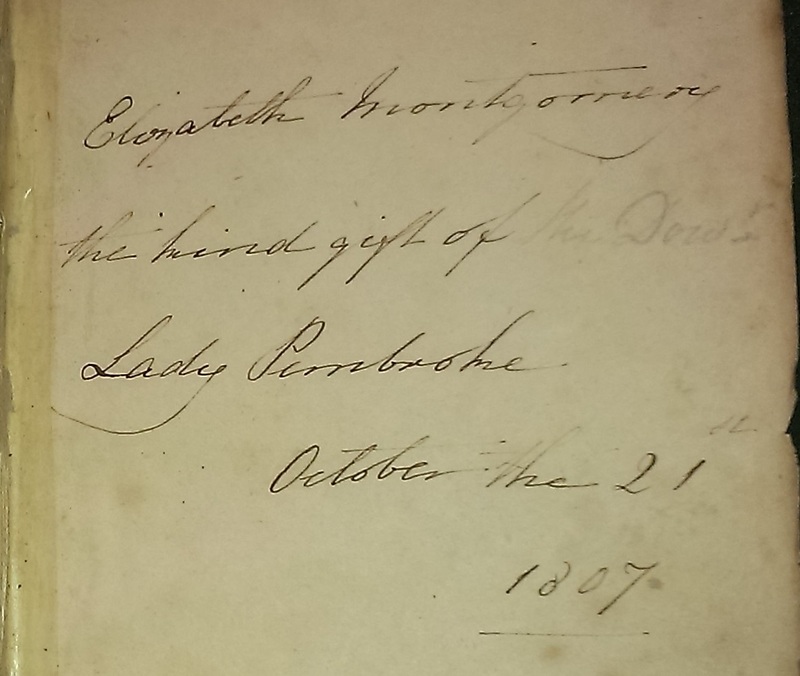 Even Lady Pembroke generously welcomed him at their seat Wilton House (though she blocked his adoption of the surname Herbert). He was liked especially by his half-brother George (the future 11th Earl), who had no other brother. Money came out of the Herbert family for them for almost a full hundred years. Think he grew up mainly at Wilton. Not sure how much contact he had with his mother Kitty Hunter. The Earl of Pembroke paid her a pension. Presumably she did not visit Wilton. But they stayed in contact. Her new lover the (future) Earl of Bristol was Reebkomp's godfather, and her eventual husband Alured Clarke stayed in contact with Reebkomp (and with the Montgomery family, after Reebkomp's death). He is referred to in letters as "Reeb" or "Rep:". He was educ Eton 1767-71. First record is June 1773, age 10. 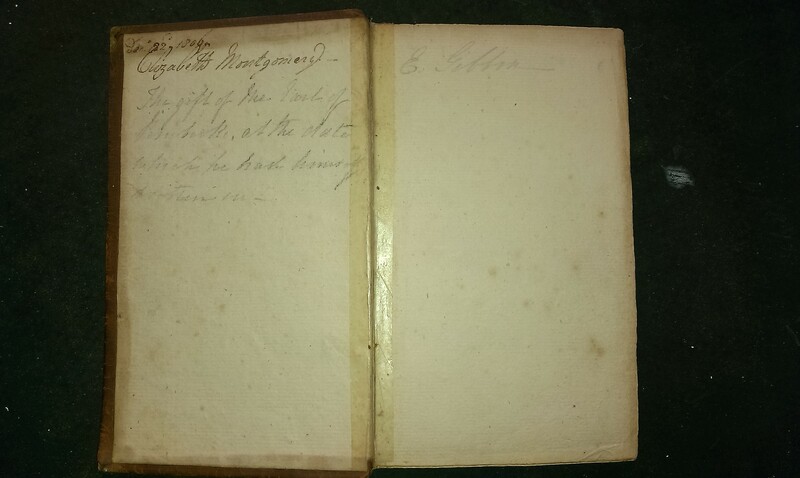 See Royal Navy career of Augustus Montgomery 1773 to 1797. He was in England and present at Wilton House during the Royal visit 1778. He sailed to North America 1779. He served in American Revolutionary War, 1779 to 1783. There was a story among his Gibbon descendants that he went on the Grand Tour with his half-brother the future 11th Earl. But [Pembroke Papers, vol.I] shows no sign of him on his brother's lengthy tour (which was in 1775-80). The 11th Earl sat for a portrait by Greuze in Paris in 1780, and Reebkomp had a matching portrait of himself painted by Greuze. However [Pembroke Papers, vol.I] shows no sign of him in Paris with his brother in 1780. More likely it was painted after he went on leave in 1783. 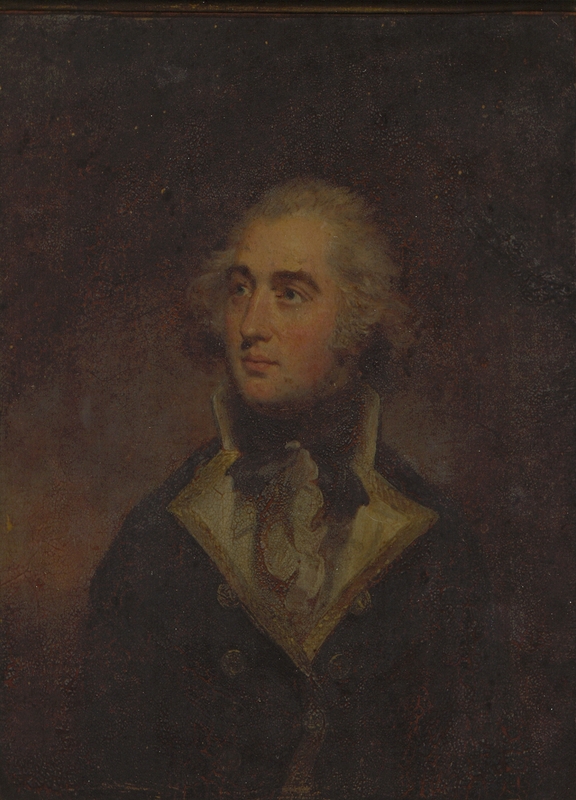 He took the surname "Montgomery" on receiving his commission as Captain in 1782. Listed as "A. Montgomery" in [Dublin Almanack, 1783]. He went on leave in Sept 1783 for nearly 5 years. 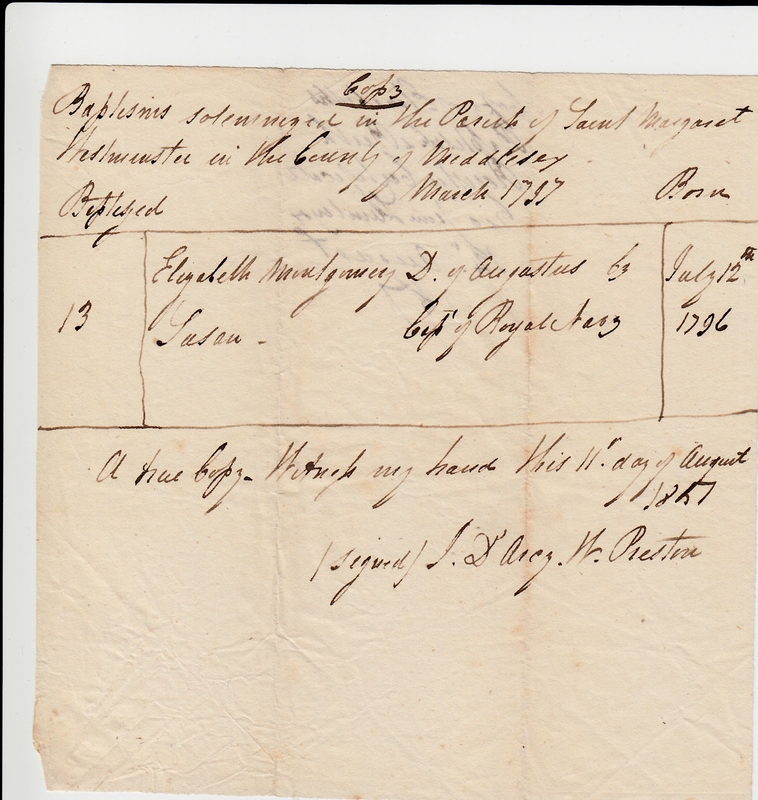 [Pembroke Papers] says he joined Lady Pembroke at Nice in Nov 1783. [Pembroke Papers] says that when out of the Navy, in 1783-88, Augustus spent his time between England and the Continent. He served in the Mediterranean in 1790-91. Presumably in the Eastern Mediterranean, and that is how he met his wife. May 1791, leave (got married, George conceived). He mar 1791 to Susan Maltass [born est c.1770]. Marriage was settled by his father the 10th Earl. However, Reebkomp in his will 1796 still refers to "my beloved wife Susan". His father the 10th Earl died in Jan 1794. Nov 1795, leave (Elizabeth conceived). His will is dated 13 June 1796, written on board his ship the Theseus at sea. Augustus died on board his ship the Theseus at Cawsand Bay, Plymouth, 6th Feb 1797, age 34 yrs. There was apparently no fighting so he may have died of some illness. He was bur 16th Feb 1797 in churchyard of Stoke Damerel church, Plymouth. No monument erected to him there. His will was proved (by 11th Earl) 11th Mar 1797, Prerogative Court of Canterbury. There were family names Augustus, Augusta and Montgomery in the Gibbon family after him. His widow Susan lived on for many years. She was living Paris at time of her death in 1851. Note her mother was French. Susan, "otherwise Suzanne", is listed as residing at 62 rue Neuve-Saint-Augustin, Paris at time of her death [SOG document]. Listed as "widow, householder". Her will dated 12th Dec 1850 [SOG document]. She died 12th July 1851, age est c.81 yrs [letter to Arthur Augustus Gibbon 27th Dec 1882]. Admin of estate 14th July 1853, Prerogative Court of Canterbury, "All property to her son Augustin Henry Saladin Montgomery". mar 1814 to Arthur Gibbon and had issue. "Saladin" is the great medieval Muslim leader who fought the Crusaders, seems an amusing reference to his mother's Turkish background. Augustus Reebkomp as a young man. This is a photo of a lost portrait, thought to be by Jean-Baptiste Greuze. Maybe painted at the time Reebkomp went on leave from the navy in 1783. This is one of the two Greuze portraits. This one was sold around WWI and is now missing. Entry for Reebkomp on pp.446-447 of [Eton College register, 1753-1790]. Quite something for an illegitimate child to be sent to Eton. There is a portrait of Capt. 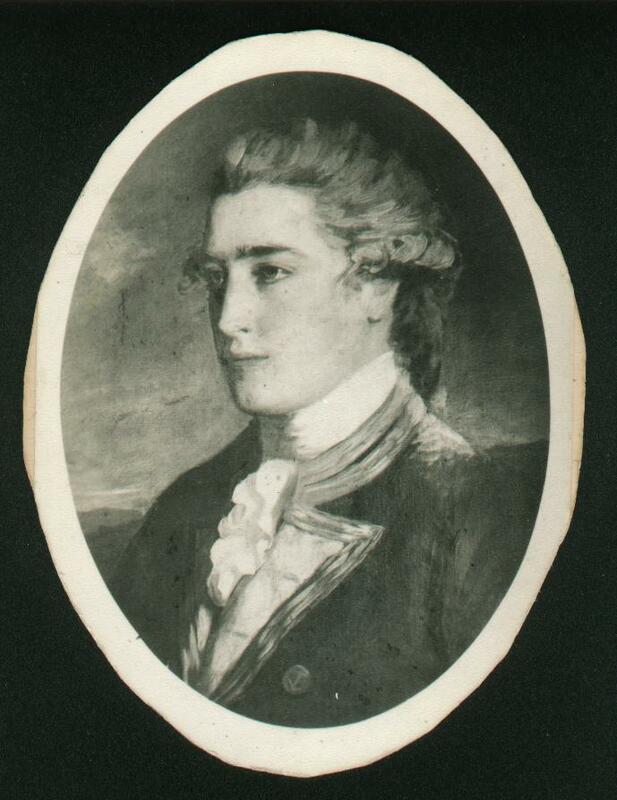 Augustus Montgomery dated 1789 (age 27) by Sir William Beechey. The portrait was commissioned by the 10th Earl. It was exhibited at the Royal Academy 1792 (when everyone involved in the affair was still alive). It is now at Wilton House. A quarter-size copy, in possession of the Gibbon family, of the original portrait at Wilton. 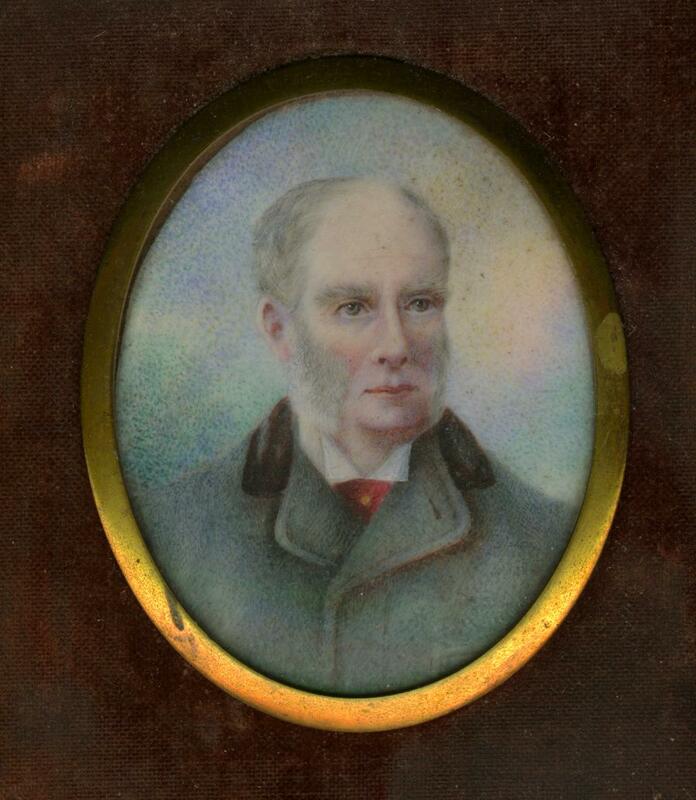 This copy is thought to have been painted by Reebkomp's great-granddaughter Florence Gibbon around the turn of the century. See full size and alternative scan. 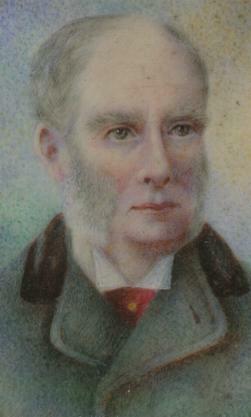 (Left) Detail of a portrait of her father by Florence Gibbon. See full size. (Right) Detail of our copy of the Reebkomp portrait. See full size. Seems to be the same style. Florence must have been allowed in to Wilton around the turn of the century to copy it. Looks like a sketch of the portrait at Wilton. 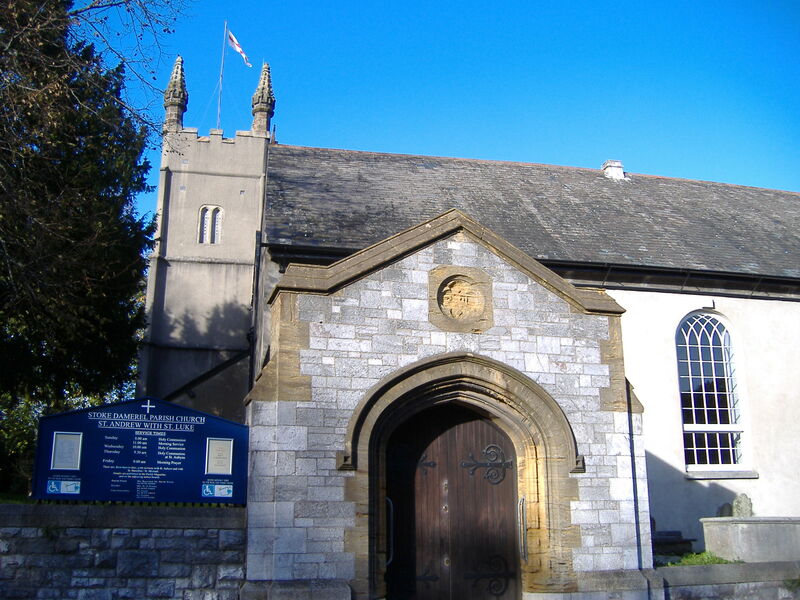 The parish church of St.Andrew & St.Luke, Stoke Damerel, Stoke, city of Plymouth, Devon. Augustus Montgomery was buried in the churchyard here in 1797. No monument. This is at E end of Paradise Road, S end of Stoke. See satellite view and street view. The church of St.Andrew & St.Luke, Stoke Damerel, Plymouth. Photo 2006. At time of her death in 1851, Susan Maltass was living at 62 rue Neuve-Saint-Augustin in Paris. This is now rue Saint-Augustin, between Avenue de l'Opera and Rue de Richelieu. Though street view shows that numbers on rue Saint-Augustin do not go up to (or even close to) no.62 today. Rue Neuve-Saint-Augustin (now rue Saint-Augustin), Paris, on old map. From TerresDecrivains.com (which says articles are Creative Commons). 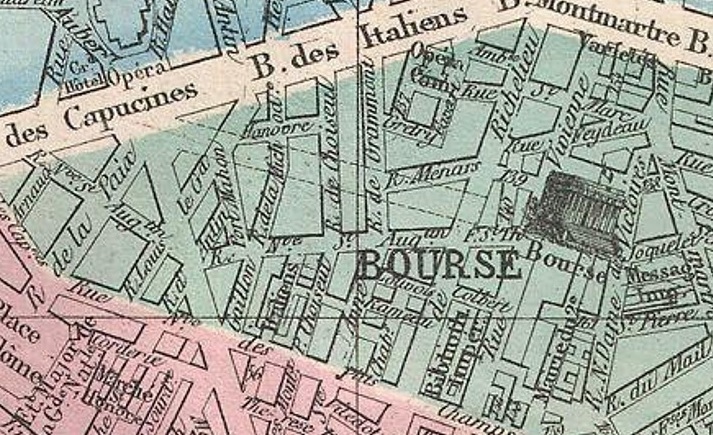 Rue Neuve-Saint-Augustin (now rue Saint-Augustin), Paris, on 1864 map. 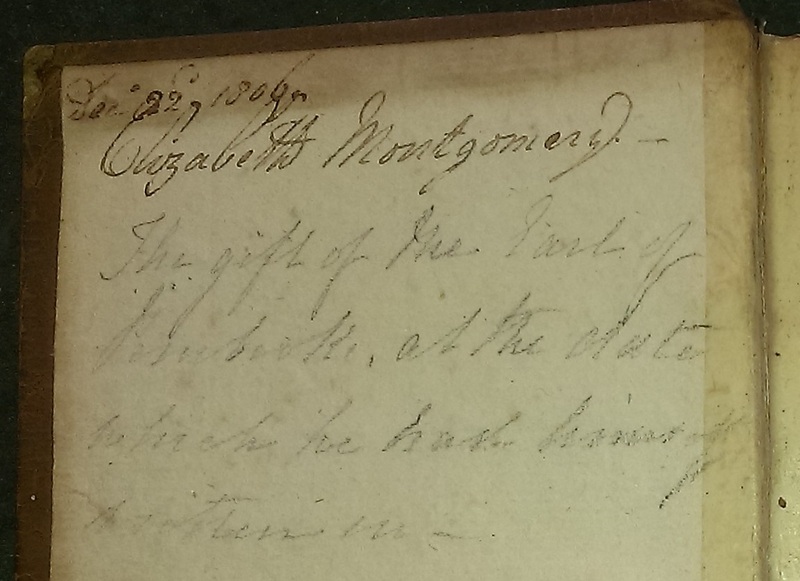 Inscription on a book given to Elizabeth Montgomery (age 10) on 22 Dec 1806 by her uncle the 11th Earl of Pembroke. 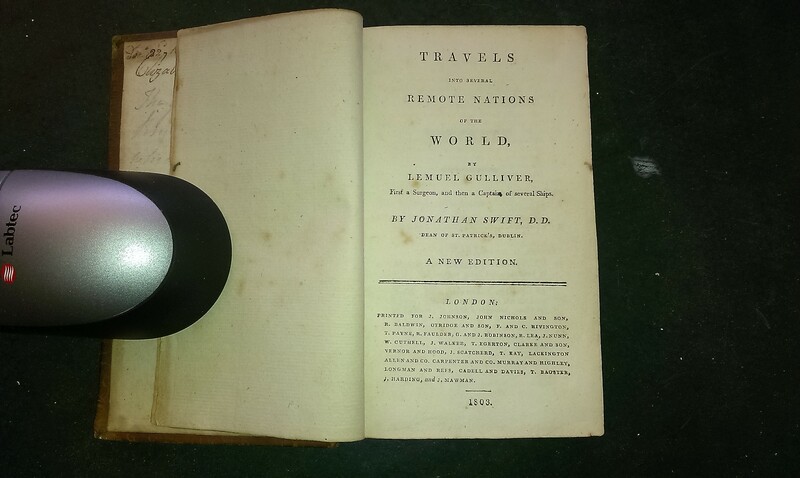 The book is an 1803 edition of Gulliver's Travels. 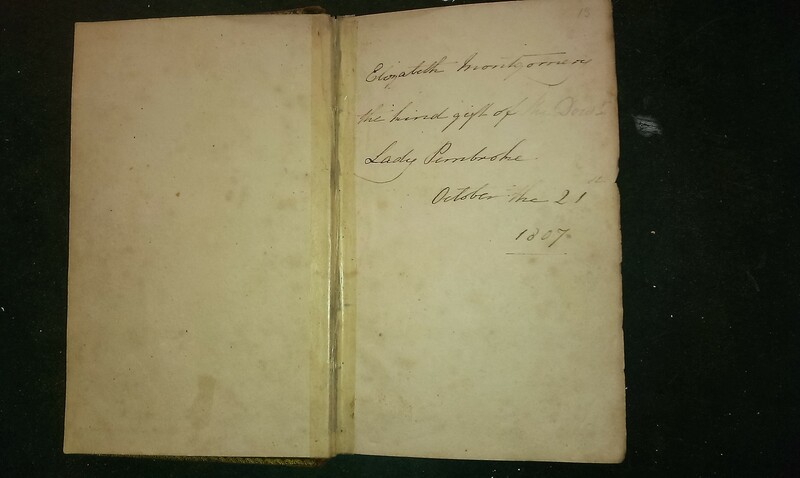 Inscription on a book given to Elizabeth Montgomery (age 11) on 21 Oct 1807 by "the Dowager Lady Pembroke". This is Elizabeth Spencer, widow of the 10th Earl of Pembroke, who is being remarkably generous to the daughter of her husband's natural son. 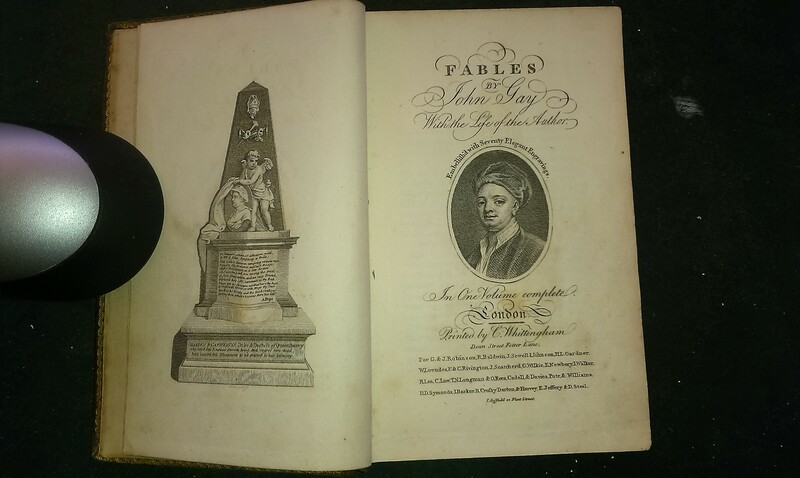 The book is Fables by John Gay. 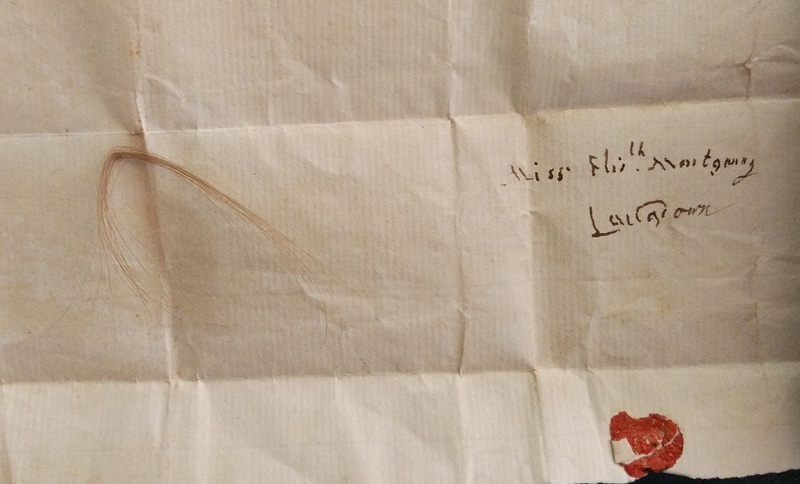 A lock of hair, with writing "Miss Elizabeth Montgomery" and something illegible. "I am glad Lord P. [Pembroke] provided well for them [George and Elizabeth] and he was obviously very fond of them." 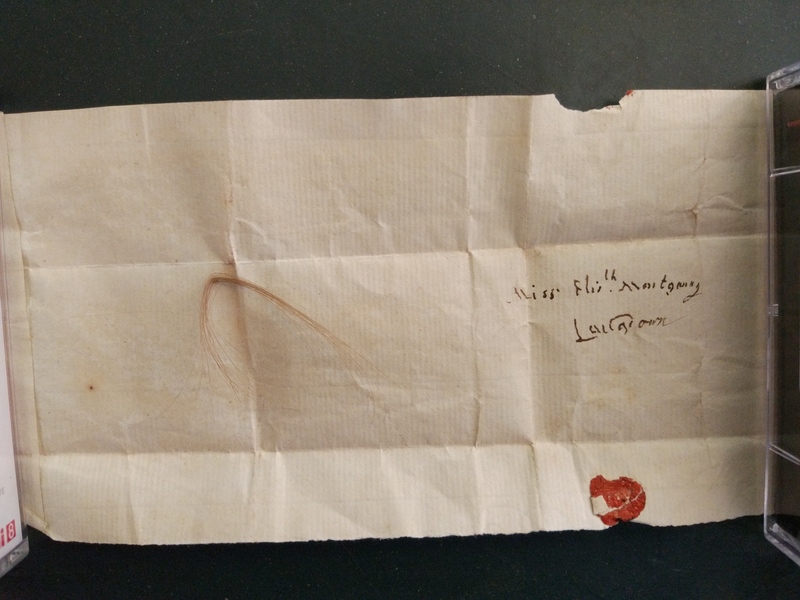 [Letter from 16th Earl of Pembroke, 1960] after making contact with the Gibbon descendants of Elizabeth Montgomery. The 10th Earl died after George was born but before Elizabeth existed. It was the 11th Earl who really provided for them.